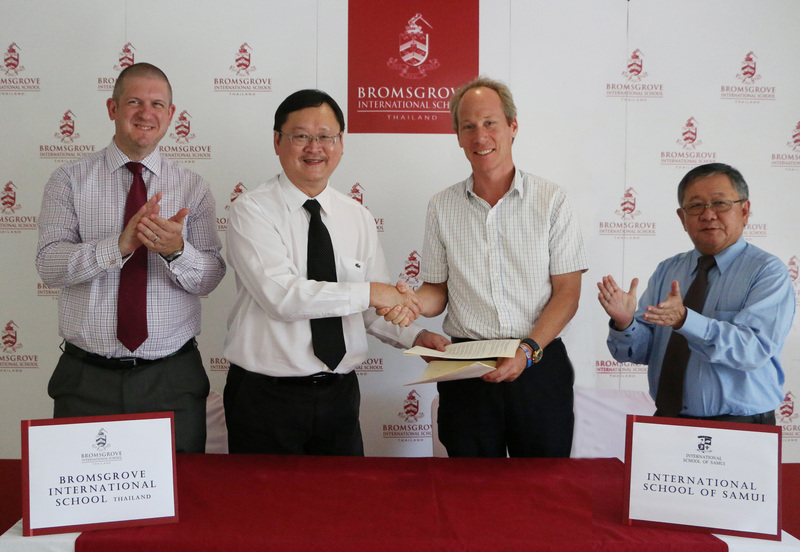 The official ceremony celebrating the partnership between Bromsgrove International School Thailand (BIST) and the International School of Samui (ISS) was held on 21 April 2017 at BIST’s Windsor Park Campus. 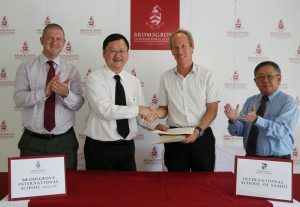 Thanks to this collaborative partnership, Year 11 students from the International School of Samui now have a clear pathway to a UK Sixth Form curriculum of A-Levels and/or the Diploma programme at Bromsgrove International School Thailand, one of the leading boarding British International Schools in Bangkok. (From left to right) Dr Daniel Moore, Headmaster & CEO, BIST, Mr Prasit Pawakranond, Chairman of BIST Board of Governors, Mr Jeremy Lees, Headmaster of International School of Samui, Mr Wicha Leeskul , BIST Board of Governors, at the signing ceremony.